The cost of solar photovoltaic power modules has been drastically lowered over the past year or so. 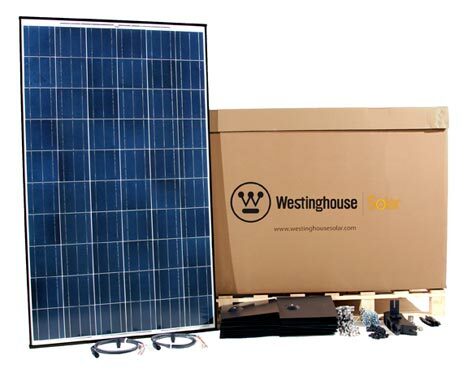 In an attempt to capitalize on the decreasing costs, Westinghouse Solar has announced they will be introducing a line of “do-it-yourself” solar power kits for the home. The ease of installation and low cost of the kits are expected to make them appealing to contractors and DIY homeowners, who have always been put off by the high cost of a solar rooftop system. Each kit will include Westinghouse Solar AC panels complete with integrated racking and inverters, panel splices and roof flashings. All the customer has to do is add wiring to the rooftop and a circuit breaker in the electric service panel to begin producing clean, renewable power. However, Westinghouse is of course recommending that a licensed professional electrician take care of the wiring. Between the lower solar photovoltaic prices and federal and state solar incentives, the payback on purchasing this DIY kit could be the shortest any solar energy payback has been yet. The solar industry has grown faster than any other market in Germany, and with these lowering costs and increasing ease of installation, the solar industry has the potential to grow just as quickly in other countries around the world. Interested in picking up a kit for your own home? Westinghouse Solar kits can be found through home improvement retailers, electrical distributors, local solar installers and contractors. More information is available on the Westinghouse Solar website.